The relentless pursuit of Father Time, genetics, and too much exposure to the sun can combine to cause the lids of your eyes to droop and sag, and unsightly bags to form under your eyes. One of today’s most popular cosmetic surgeries is Blepharoplasty – or eyelid surgery. Women and men alike are undergoing this surgical procedure to address their droopy eyelids and under eye bags. A blepharoplasty tightens and removes excess upper and lower eyelid skin, muscle and sometimes fat for a more alert and youthful appearance. It is sometimes done in conjunction with other procedures such as a brow lift. 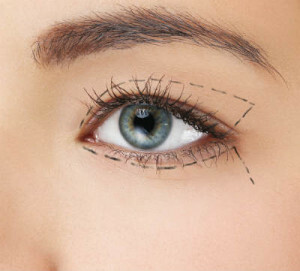 During the procedure, small incisions are made in the natural crease of the upper eyelid. Excess skin and fat are removed and the incisions are closed. For the lower lids, incisions are made under the lashes or inside the eye. These tiny incisions will be completely invisible once healed. It is performed under general anesthesia, as an outpatient procedure, where Dr. Guarnieri will take every precaution for your safety and comfort. You can return to work within two weeks. The final results of your procedure will be visible within a month. You may experience some pain and blurred vision. Expect your eyes to be swollen and bruised following surgery. This is normal and will subside. Apply ice packs to your face to soothe pain and control inflammation. Heavy exercise is not recommended for several weeks after surgery. Walking is recommended in the early phase of your recovery…but take it easy! The goal is to promote circulation and healing. Avoid lifting heavy weights and exercises that require you to bend over for up to three weeks. Dr. Guarnieri would be happy to discuss this life-changing procedure with you. Call for a consultation today!